I am also using the alloy elbow from the RS3 / TT-RS - this includes provision for a Bosch TMAP sensor to replace the old PTC sensor that Motronic uses on the intake manifold. These sensors have better resolution than the OEM sensor and are cheaper and commercially available. 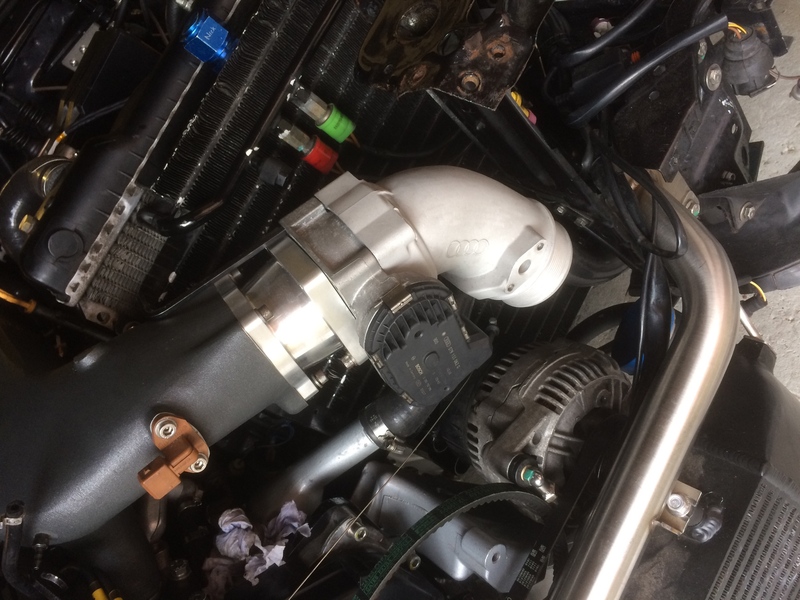 The RS3/TT-RS as stock use an e-bypass valve which is cast into the intake elbow, but it is too small for the desired air mass as well as being in an awkward place to plumb in as I have AC/Climate. So I chopped it off and welded the hole up. The position still needs a slight tweak but will marry up nicely to the Wagner intercooler. Finally someone makes use of that throttle body inlet. I thought I was going to be the only one! Nice catch with using the Manual one as opposed to DSG as DSG is much tighter. Excellent work as always! Actually I looked at the RS3 part after you mentioned it a while back, its just taken me an age to get anything done on the car.